If it's traditional IC engine trucks that you are after then the choice of fuel, be it Diesel, LPG or CNG can still offer significant savings due to innovative technology from Linde. 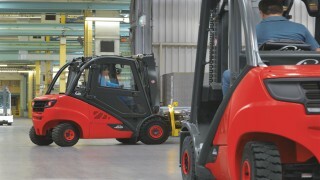 Since 1959 when Linde launched its first hydrostatic drive the concept has continued to be refined to match the changing demands of its customers and markets. 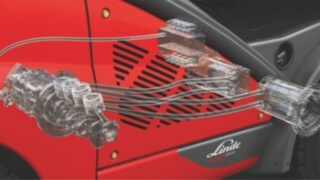 The Linde Hydrostatic Drive provides power via a closed circuit, maintenance-free oil circulation system and transmits it equally to each drive wheel motors - meaning there's no need for a differential, coupling or gearbox. Braking is also hydrostatic: the truck stops automatically when the pedals are released. Smooth acceleration. Gentle braking. Precise steering. This design increases handling performance while reducing fuel and maintenance costs. It is precisely these benefits that have made Linde one of the leading global brands in the field of industrial trucks - and a benchmark for cost effectiveness and performance. Thanks to the variable displacement pump for lifting hydraulics, the H20 - H50 Evo models have become even more efficient. Where an internal gear pump with fixed oil delivery was previously used, power transmission is now provided by an axial piston pump with variable delivery volume. This means that the lifting speed and engine speed are kept separate from one another. The pump has been oversized intentionally, ensuring that only a very low engine speed is required for the lifting movements to be carried out. 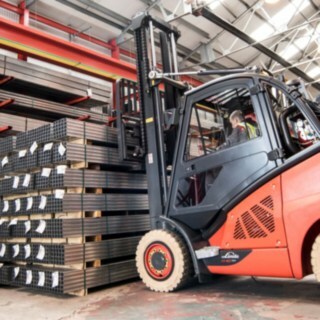 Lifting noise and fuel consumption are reduced considerably - by as much as 28% in customers tests.